The last remnant of the old New England Distilling Company will be razed. Covington's urban design review board OK'd the request from the developers of Duveneck Square to tear down the towering structure near the railroad overpass on Eighth Street. A map from the 1930s, when the building was constructed to serve the distilling company located to its north on Pike Street, indicated that at one time it would hold 8,000 "b" barrels of whiskey. 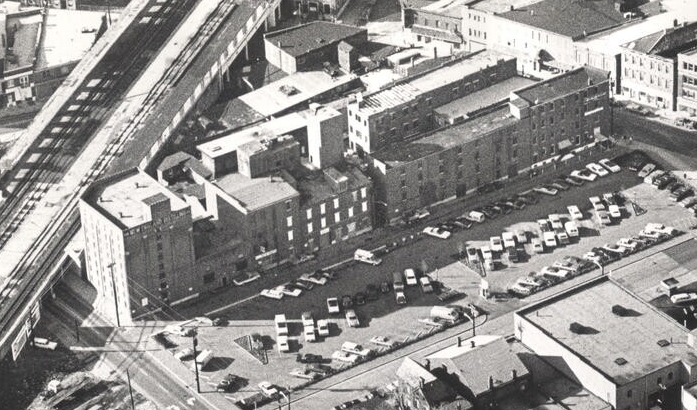 Though the building retains a high level of historic integrity, a development agreement between the City of Covington and Cincinnati-based NorthPointe (doing business as 730 Washington LLC), which is developing the sprawling Duveneck Square project, allowed for the demolition. Similar circumstances in an amended agreement allowed NorthPointe to raze a block of Victorian commercial buildings that were also part of the distillery, though most recently were used by Steffen's Rental. The first phase of Duveneck Square has residential units going up on the east side Washington Street between Seventh and Eighth Streets. There is also expected to be a restaurant on the first floor of that phase. Subsequent phases will be constructed on the west side of Washington between Pike and Eighth Streets. Renderings of what those phases could look like often retained the presence of the barrel building, but that changed as the plans envolved. "We are a work in progress with our plans," said Lisa Stovic, the project manager for Duveneck Square. The decision to raze the tower was related to where a parking structure would go. "We since looked at the capacity of this project on this side of Washington Street and we could bring in a significant amount of office space." That changed NorthPointe's plan from creating a 500-space parking garage to serve residents, commercial tenantns, and visitors, to a 700-space garage. The smaller garage could have been constructed perpendicular to the railroad line, possibly sparing the building. But the larger garage plan changed its positioning, and the space is needed. "We will have to have this building come down," Stovic said. As a condition of granting permission to demolish the 84-year old building, the UDRB required that a thorough review of the building be conducted with high-resolution photographs and drawings that could be delivered to the Kenton County Public Library's history department.